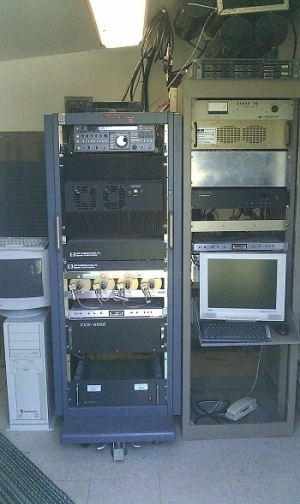 The CCECPSCO's first D-Star repeater was installed on September 12, 2010 at the Stutsmanville, MI repeater complex about 5 miles NW of Harbor Springs, MI. This repeater replaces the KO8P FM analog repeater that was on this frequency for a number of years. Since it is using the same transmit and receive antennas and tower-mounted receive preamplifier as the N8DNX UHF repeater, it should have conisderable range covering much of Northern Lower and Eastern Upper Michigan. Early tests seem to bear this out. Go to the following link for more information on the repeater site in general. Hams with D-Star equipped radios or DV-Dongle users who are members of the CCECPSCO or reside at least part of the year in Northern Michigan may register with the W8CCE Gateway at the following URL. Do not register if you are already registered with another gateway system! Click on the link below to see a list of receintly heard D-Star stations world-wide. This site also has additional good infomration on D-Star repeaters and D-Star in general. If the "Reporting Node" column says W8CCE, then the user callsign was heard through the W8CCE D-Star repeater. Below is another good site for general information on D-Star and another repeater list. 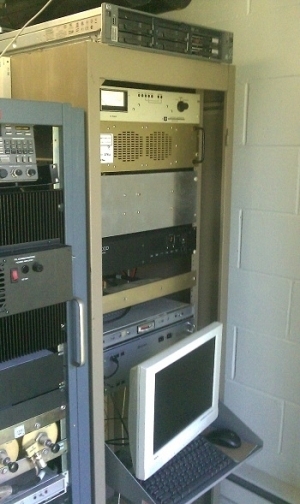 This is most of the equipment that's located in the repeater room in the Stutsmanville repeater complex. Below is a list of what you see. TX/RX band combiner for mixing UHF TX and W8GQN repeater signals. UHF TX and W8GQN TX and RX use the same transmission line. Monitor and keyboard for gateway computer with D-Star repeater hiding behind. The CCECPSCO W8CCE D-Star repeater is located just behind the flat-panel monitor in this picture. The panel with the black Ethernet cable plugged into the front just behind the top of the monitor is the D-Star controller. Just below that is a slightly larger panel that is the UHF module for the D-Star repeater. 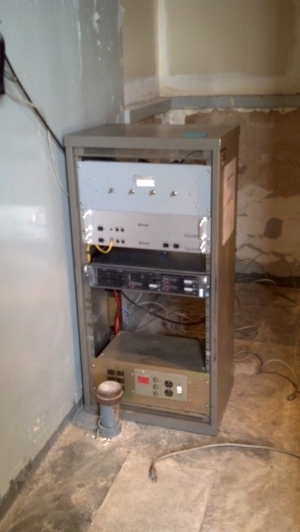 Sitting on top of the rack is the HP DL-385 computer that is running the gateway software for the D-Star repeater. That computer connects the D-Star repeater to others over the Internet and is the system you log into to register as a D-Star user. The KD8QCC 444.0375 DSTAR repeater in Gaylord, MI is currently located just East of the Alpine Center just North of Gaylord MI. The 8 bay folded dipole antenna is about 250' up one of the commercial towers there and the repeater equipment is located in a fairly large, clean equipment room, pretty much by itself, adjacent to the tower. I don't have a current picture of the transmitter room, so for now we'll leave the picture of the repeater at it's old, dirty, falling-apart location. I can assure you that the new location is much more appropriate and that our equipment greatly appreciates it. From the top down the equipment is duplexer, UHF band module, DSTAR controller, HP DL380 gateway computer, and at the bottom is the old GE power supply that just keeps on ticking. We are approved for placement of two UHF antennas on the tower (one for TX and the other for RX as we do at Stutsmanville), but for now there's no budget to obtain two proper antennas. We expect the total cost to be in the range of $2,000. Please let us know if you would like to contribute toward the purchase of those antennas or if you have antennas that might be appropriate. The target coverage is planned to fill in as much as possible from North of West Branch up to the Mackinac Bridge, West to where there's good coverage from the D-STAR repeaters in the Traverse City area, and East as far as possible toward Alpena. This will complement our coverage from Stustmanville which covers from Gaylord North pretty much to Sault Ste Marie and well West into the U.P. We currently have about 1/2 our target range at this point with the existing antenna. When both antennas are installed, not only will the coverage be much better, but also the receive sensitivity for hand-held users. This follows on the exceptional performance we've experienced with the 442.375 (analog) and 443.375 (D-STAR) repeaters in Stutsmanville using the same approach with no duplexer and a mast-mouted preamplifier. Also, when both antennas are installed, we'll be able to install an analog FM repeater we already have available for UHF to cover that area.